One hundred years ago or thereabouts, Talbot Mundy was one of pulpdom’s superstars, his works appearing regularly in Adventure, the classiest rough-paper sheet of the era. His 1912 short story for that periodical, “The Soul of a Regiment,” was so popular that it was reprinted seven times in subsequent issues. 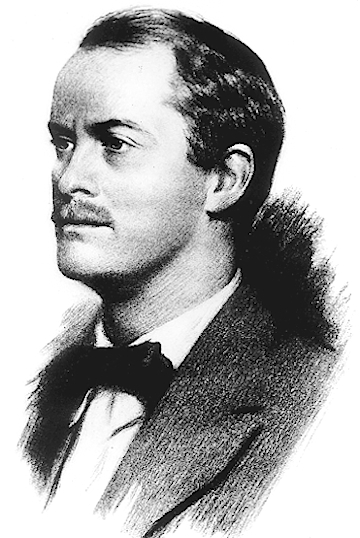 Mundy’s 1916 novel King—of the Khyber Rifles, originally published in Everybody’s Magazine, became a career-defining best seller and established him as the premier writer of exotic adventure fiction. And yet, despite having penned more than three dozen novels and countless shorter yarns, he is almost totally forgotten. Born in London on April 23, 1879, William Lancaster Gribbon came from a stable, well-to-do family and enjoyed the benefits of a comfortable upbringing and a solidly middle-class education. In spite, or perhaps because, of that background he developed a bad case of wanderlust and embarked upon a series of adventures . . . and misadventures. Mundy’s first major story for the pulps. Young Willie Gribbon drifted aimlessly after graduating from Rugby, one of England’s oldest and most distinguished public schools. He studied agriculture in Germany before securing passage to India and working as a British colonial merchant. He married in 1903 but couldn’t remain faithful to his wife. In British East Africa he adopted the name Thomas Hartley and added bigamy to a long list of indiscretions. Hartley’s wayward eye and dishonest practices earned him the nickname “Makundu Viazi”—which is Swahili for “White Arse.” He worked as a town clerk but was a con man on the side; eventually he even spent time in jail. Upon visiting New York in 1910 the erstwhile Willie Gribbon immediately ran afoul of local thugs and got himself beaten up. While in hospital recovering from a fractured skull he decided to try his hand at writing, drawing for inspiration on his experiences in India and Africa. As “Talbot Mundy” he first graced the pages of Adventure in 1911. Mundy later invented for himself a background every bit as fanciful as those devised for his fictional characters: He claimed to be a famous big-game hunter who had fought in the Boer War. Adventure‘s readers—and its editor, Arthur Sullivant Hoffman—were taken in by Mundy but loved his evocative yarns, which invariably had the ring of authenticity. Talbot Mundy as a young man. 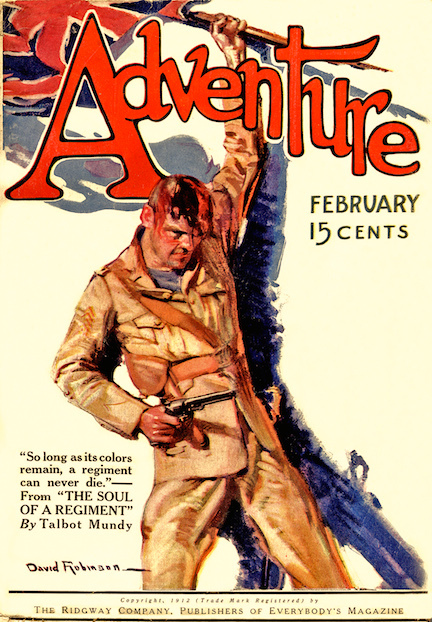 During the Teens and Twenties he wrote feverishly, mostly for Adventure but occasionally for such other magazines as Argosy, Romance, Pearson’s, and Blue Book. Achieving success as a fictioneer enabled Mundy to settle down, although he never tamed his wandering eye and therefore married three more times. Despite earning top dollar for his fiction, Talbot was always broke because he spent money as fast as he made it. As the Great Depression got underway some editors soured on Mundy because he requested cash advances for stories that rarely materialized when they were due. In 1935 he stopped writing fiction as a full-time freelancer to take a steady job scripting the children’s radio serial Jack Armstrong, the All-American Boy. He spent five years so occupied, often working parts of his old novels into the show’s continuities. A devoted Theosophist, Mundy settled down considerably in the Thirties and found happiness with his fifth wife, Dawn, before passing away in 1940. I never read a word of Mundy until I started seriously collecting pulp magazines in the late Nineties, but familiarizing myself with his oeuvre has provided me with innumerable happy hours since then, and today I number him among the handful of top pulpateers worth collecting. Although King—of the Khyber Rifles and The Ivory Trail (1919) rate high on my list of favorite Mundy novels, I most enjoy the later exploits of ex-soldier James Schuyler Grim, a.k.a. Jimgrim. The Nine Unknown (1923), The Devil’s Guard (1926), and Jimgrim (1931, serialized in Adventure as King of the World) are high-adventure thrillers impregnated with occultism and peopled with memorable supporting characters. It’s always fun to share danger vicariously with Jimgrim’s “posse,” which includes giant strong man (and usual narrator) Jeff Ramsden, the magnificent Indian warrior Narayan Singh, and the wily, trouble-prone babu Chullunder Ghose, who later won “leading man” status. I’m somewhat less fond of Om: The Secret of Ahbor Valley (1924), an interminably long and rather unexciting novel habitually mentioned as one of Mundy’s best. 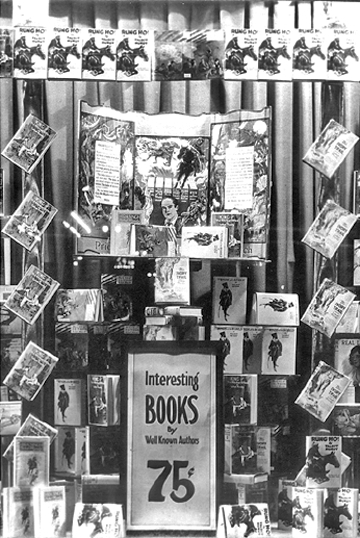 Display of Mundy’s books in store window. I’ll be the first to admit that Talbot Mundy takes some getting used to, especially if you’re a pulp fan weaned on the vivid action of hero pulps and the crisp prose of Black Mask and competing magazines that perfected the hard-boiled style. Mundy characters tend to strategize far too much, and key action sequences often unfold “off stage,” only to be described at length after the fact by observers. A particularly harrowing scene in King—of the Khyber Rifles is described so casually that I read a half-dozen pages beyond it before realizing what had just transpired. But Mundy is among those rare storytellers who draws readers into his world and holds them there by virtue of his gift for spinning tales suffused with authenticity. He’s one of the field’s true giants and is well worth sampling. This article brings back some great memories of reading Talbot Mundy back in the 1970’s when I started to collect ADVENTURE. Long time pulp collector Harry Noble and I started to read through the entire Jimgrim series. We discussed our reactions to the stories during a bi-weekly correspondence that lasted several years.